Major award and funding for VR researcher. Ella Rhodes poses the questions. 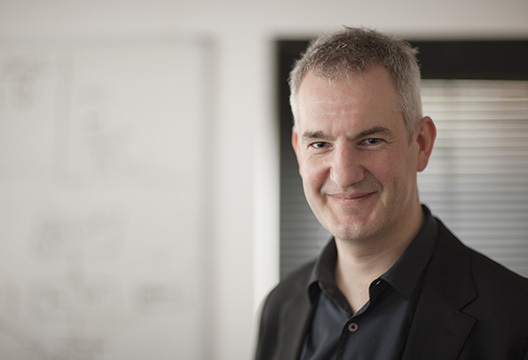 Professor Daniel Freeman (University of Oxford) has worked for 15 years researching the use of virtual reality (VR) in helping people experiencing psychosis. He and his research team were the first winners of the National Institute for Health Research i4i Mental Health Challenge Award – which challenged researchers, academics and small and medium enterprises, to come up with innovative technologically-based ideas for improving patient care and outcomes in mental health. The £4 million of funding will be used to build on Freeman’s work in this area developing the VR treatment, which involves graded virtual exposure to fearful situations, a clinical trial, and the eventual roll-out of the treatment across the NHS if successful. Why is virtual reality a useful tool in psychological treatments? VR has extraordinary potential to help people overcome mental health problems. Difficulties interacting in the world are at the heart of mental health issues. Individuals with severe mental health problems all too often withdraw from the world because of anxiety, triggered by paranoia, voices, or a lack of self-confidence. With virtual reality, individuals can repeatedly experience the feared situations and learn to overcome them. VR goes right to the heart of the central mechanism of change in therapy. The beauty of VR is that individuals know that a computer environment is not real but their minds and bodies behave as if it is real; hence, people will much more easily face difficult situations in VR than in real life and be able to try out new therapeutic strategies. This learning then transfers to the real world. How have advances in virtual reality changed the way it’s now used in psychology? I’ve been working on VR for psychosis for over 15 years but am still struck by how the technology has come on in leaps and bounds in the past couple of years, thanks to investment by major companies. We can now really make therapeutic use of the technology in ways that were not possible before. One of the most innovative features of our VR is our virtual therapist. A friendly computer-generated avatar, voiced by a real person, carefully guides the patient through the therapeutic work, helping them practise techniques to overcome their difficulties. In effect, the treatment is automated. This makes it potentially possible to dramatically increase access to the best evidence-based psychological interventions. But virtual reality is not a remedy in itself. It is a tool that has to be used correctly. The content of the VR matters hugely. VR is extremely powerful when the content is right. Get the content wrong and VR is ineffective and underwhelming. To separate the wheat from the chaff, it is crucial that each VR treatment is tested in a rigorous clinical trial. Tell me about the rationale behind this project and your next steps. My clinical research group has provided the first evidence that VR can help treat the problems of patients with psychosis. We have helped patients, using VR, to make the learning that the world is safer for them than they feared. This work has been recognised with the Mental Health Challenge Award. This landmark award has allowed us to assemble an amazing team, bringing together patients, psychologists, psychiatrists, nurses, designers, computer scientists, healthcare experts, statisticians, health economists. Our project comprises three main stages. First is the design and development of the VR treatment, building on the work we’ve done over many years. Our aim is a treatment that’s easy to use, engaging, and right for patient needs. Stage two is a large multi-centre clinical trial in NHS trusts across the country to demonstrate the benefits of the VR treatment. The third part of the project will see us develop a roadmap to roll out the treatment across the NHS. Our goal is clear – to combine the very best psychological science with cutting-edge technology. By doing so, we believe we can help many more individuals with mental health problems to lead the lives they wish to lead. - Find more from Freeman in our archive.